Labradorite is also the most powerful protector of the mineral kingdom, creating a shielding force throughout the aura and strengthening natural energies from within. It protects against the negativity and misfortunes of this world, and provides safe exploration into alternate levels of consciousness and in facilitating visionary experiences from the past or the future. Beautiful, mystery and stylish handmade bracelet. One of a kind. 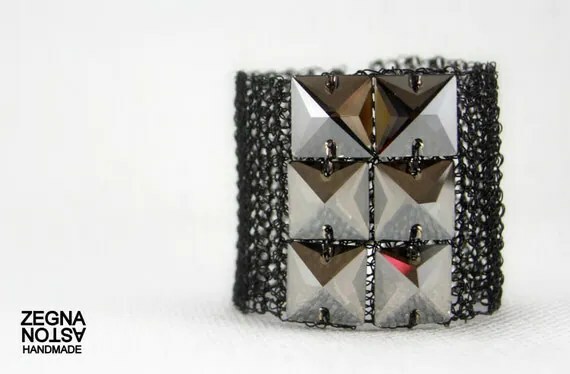 A lovely, lacy lattice pattern gives this cuff bracelet a cool modernism. It’s easily our favorite pairing out there – black and white. The way to wear it is with a crocheted structured cuff. Practically every collection touched on the monochrome revival. It’s the perfect way to take it from day to night. Team with a pleated black midi skirt for easy office outfit. Orange is the new black! While spring may seem like eons from now, and it’s certainly too cold to pull out any spring dresses, you could dabble in one of spring’s hottest makeup trends now—the orange lipstick! 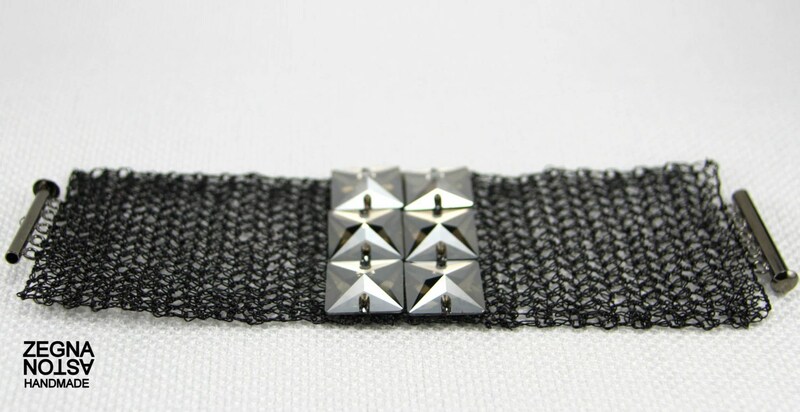 Best with perfect Black bracelet cuff. 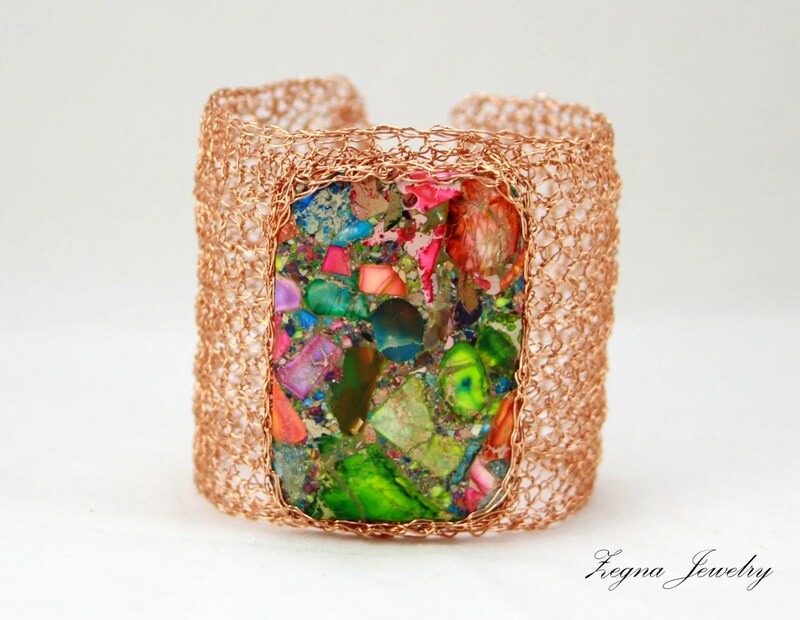 This coated copper wire crochet bracelet features 6 square Swarovski crystal studs for style that walks on the edge. Grey Labradorite Faceted Beads Statement Necklace. 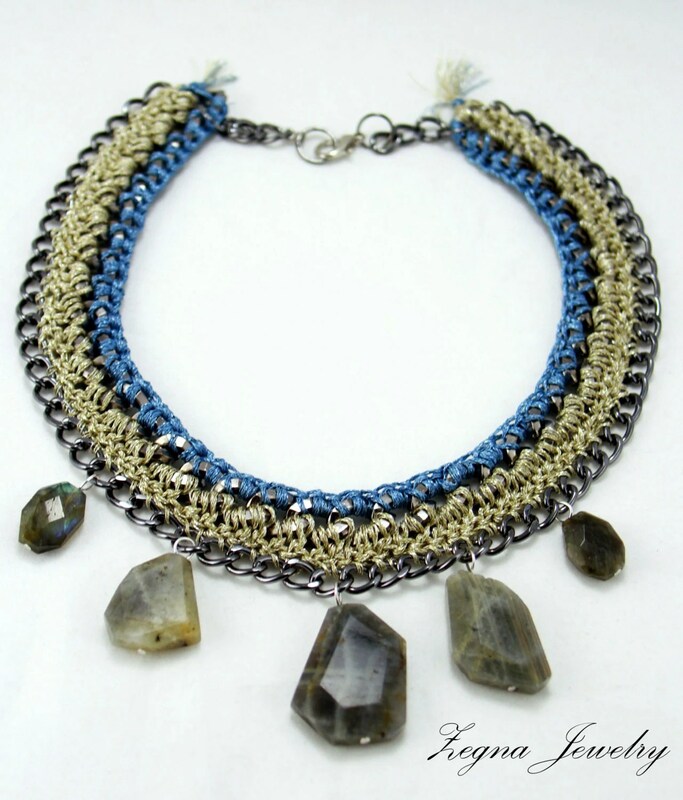 Amazing handmade statement Necklace is made of heavy gunmetal chunky chain, metallic yarn and featured with 5 beautiful shimmery faceted labradorite beads. Labradorite is very pretty and unique stone. It has color variety from grey and blue to green and cobalt blue. 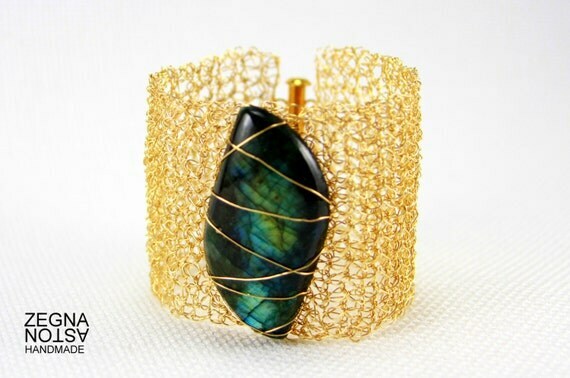 Labradorite gunmetal wire crochet cuff bracelet. 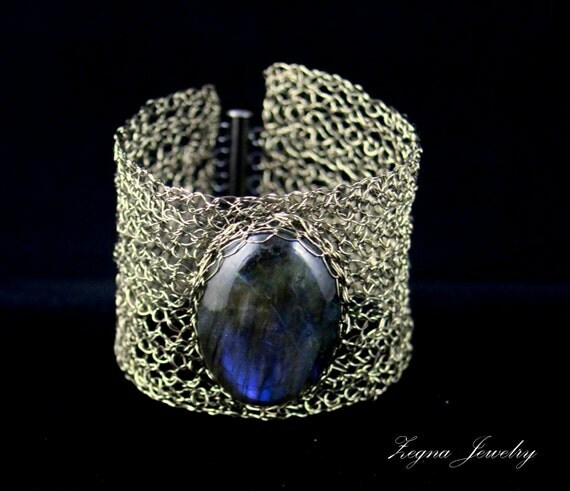 Very chic and stylush bracelet cuff os crocheted of gunmetal artistic non tarnish wire and featured with Classic blue power natural Labradorite Cabochon. 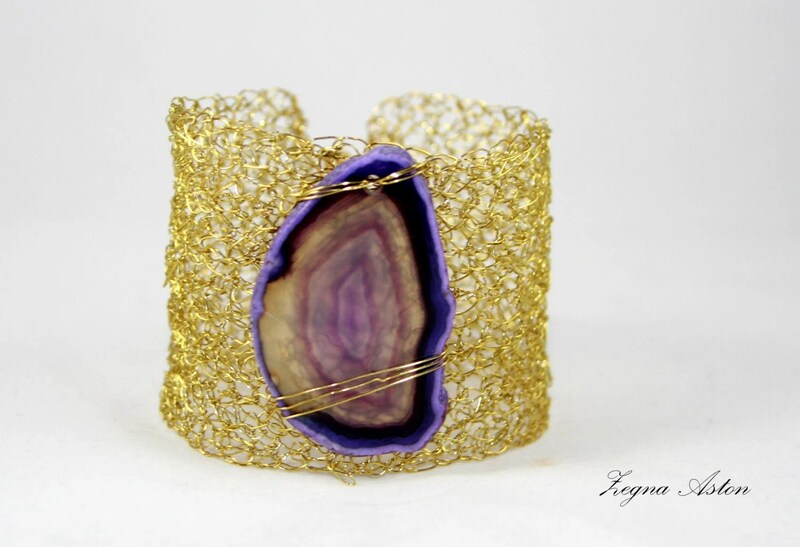 Beautiful Handmade crocheted wire bracelet cuff features Purple agate slice. – Closure: 5-strand slide clasp. 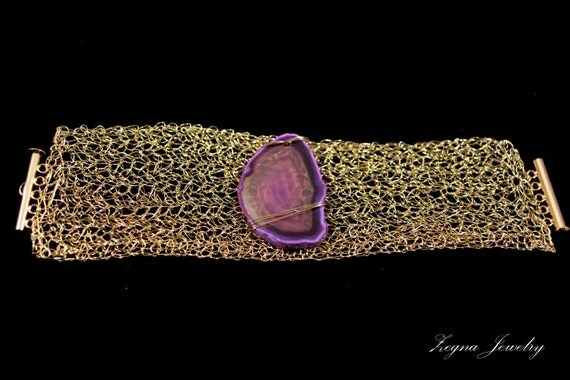 – Material: Gold tone copper artistic wire, Purple Agate Slice. Purple Agate– Is the stone of meditation and spiritual transformation. This stone works on the upper Chakra. It assists in allowing trust with your own intuition and opens the spiritual flood gates to a realm of endless possibilities. It gives us the space to “be” our spiritual selves and clears the mind for extraordinary vision and insight. Agate is composed of microscopic crystals of Quartz laid down in colorful bands or ribbons. The appearance of agate is waxy and soft. Almost always translucent and occasionally transparent. Agates are grounding stones. They help obtain a better physical/emotional balance. They work to raise consciousness. Where did the name ‘bracelet’ come from? The first known bracelets were worn by Sumerians who lived in Mesopotamia (modern day Iraq) around 2500 B.C.E. Jewelry of all kinds was a sign of a person’s prosperity. Bracelets and other jewelry were found in the royal tombs in the ancient city of Ur in Mesopotamia. It was customary for jewelry to be buried with their owners, along with their servants. Servants probably prayed to their ancient gods for a long life for their masters because of this. In ancient Greece, men and soldiers wore bands of leather on their forearms for protection. Sometimes these bands were decorated with precious metals and gemstones. They were known as Bracels, derived from the Latin word Brachium, which meant ‘arm’. Ladies were not about to be outdone by men, and so they adopted the ‘fashion’ and wore smaller versions of them, called little bracels, or bracel-ets. Bracelets made of copper are thought by some to aid in relieving the pain of arthritis. The body absorbs the copper and somehow relieves the pain. This has not been proven but people being people still wear copper bracelets, for fashion if not for pain relief. But don’t copper bracelets turn some people’s wrists green? Maybe it’s all part of the fashion statement. Unlike other forms of jewelry, bracelets have always been in vogue throughout recorded history, and been worn by men and women. The concept of unisex jewelry is older than people think.